AnandTech has had reservations about the usefulness of synthetic benchmarks to measure the performance of computers. However, testing memory is one area where it is hard to avoid synthetic benchmarks. We were particularly concerned about some of the memory benchmarks we have seen posted with the 875/865 chipset boards. Some of the more widely-used synthetic benchmarks are being used to “demonstrate” performance that we logically know – based on Intel 865/865 chipsets white papers – to be not the case. MemTest86 has been around for many years, and it is the standard in Memory Testing for many computer enthusiasts. The program boots from CD-ROM or floppy using its own DOS-like operating system, and tests memory at its most basic level. To many enthusiasts, this program is the ultimate test to determine the stability of memory. If you wonder why we would use such an ancient benchmark, it is because we have not found anything that is really better to test memory performance and stability. Apparently, we are not alone, since MemTest86 is still widely used in the Memory industry to test the stability of memory modules. As a baseline, MemTest86 was run on an 875 Canterwood system with a Pentium 4 3.0GHz CPU and 2x512MB double-sided high-speed DIMMs at timings of 2,5,2,2. This gives us a MemTest86 score at Default Settings of 2,722MB/sec. More information on MemTest86 is available at their site. Floppy and ISO versions of the program are also available at this site for download. In search of a reliable memory benchmark, we find that SiSoft Sandra 2003 is one of the more widely used memory benchmarks. Looking closer, we did not feel the standard Sandra memory test, which relies heavily on synthetic memory buffering techniques, provided the kind of sensitivity we needed for these tests. It is true that Sandra uses the same buffering techniques as in the CPU and chipset tests, but these buffering techniques themselves can often mask poor memory performance and sometimes provide memory performance scores that do not correlate well with real-world performance. While we don’t know exactly where it started, we have seen a number of enthusiast sites using a variation of the Sandra Memory, which turns off buffering techniques and comes closer to measuring raw memory performance. Macci was one of the first to use the UNBuffered benchmark – the famous Finn who is always at or near the top of the 3DMark scores. In addition, Tony Leach in England and I have used it in many reviews on other web sites. The idea of the UNBuffered Memory Benchmark is very simple – you merely turn off all memory buffering techniques. Sandra makes this very easy to do. Select ‘Memory Benchmark’, right-click ‘Module Options’, and uncheck the 9 boxes that have to do with buffering. 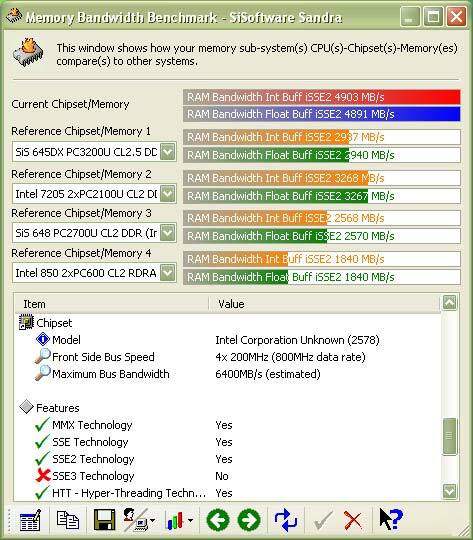 The UNBuffered Memory Benchmarks are quite different from what you may be accustomed to seeing. As an example, these are Buffered or Standard Memory benchmarks with two double-sided DIMMs on a 875 Canterwood board at stock 3.0GHz at DDR400 at memory timings of 2-5-2-2. Using the same settings for the UNBuffered Memory Benchmark (3.0GHz, DDR400, 2-5-2-2, 2x512MB DIMMs), we achieved much lower numbers. While the score of the UNBuffered benchmark is much lower than the standard Memory Test, the UNBuffered benchmarks are very comparable to MemTest86 results. This excellent correlation of MemTest86 and SiSoft Sandra UNBuffered Memory Test results seems to be true in most situations. Benchmarks are only useful in the end in how they can compare different configurations and hardware. We have found standard Dual-Channel DDR400 Performance on Intel 875/865 chipset motherboards, as you see above, in the 2300 to 3000 MB/sec range as measured with the Sandra UNBuffered Memory Benchmark. MemTest86 gives similar results. 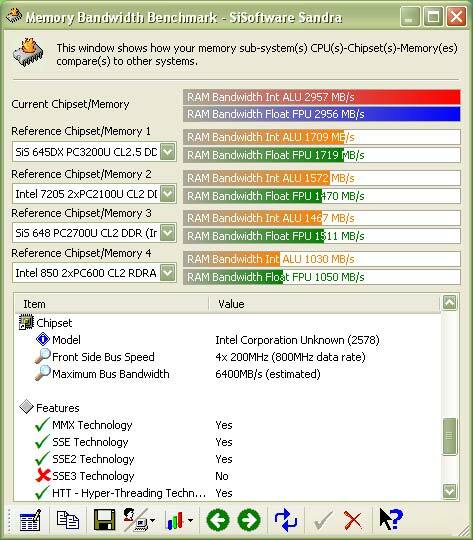 We will post a few more sets of Buffered (Standard) and UNBuffered Sandra 2003 benchmarks in this review to demonstrate the validity of the UNBuffered benchmark as a Memory Performance testing tool, and then use only UNBuffered benchmarks for the rest of the review. This single/double side/bank issue is very misunderstood. To further confuse things the memory manufacturers, who finally getting better about reporting full timing numbers, generally don't publish the side/bank count. I'd like to see an article that helps identify whose memory is really double banked, especially at the 256MB level, since its going to take 4 modules for best performance in an 875 system. Since many of these products are best available thru the internet, I don't have the luxury of looking at the modules before I buy. FYI, I'm also more interested in using well matched double banked components with low timings than in overclocking to the max. Mushkin has very low timing memory in a 512MB configuration that is double-banked, but it seems like overkill to put 2GB of memory for $800+ into the system at this point. (I also don't know how well the system would perform with this quantity of memory as I hear that more memory can slow timings down.) Their 256MB modules are single-banked unfortunately. Unfortunately, Anandtech has not added Mushkin to their test products for any of these articles (not that I have seen at least) so I cannot verify the performance. I hope this due to Mushkin not supplying them samples before they complete testing and go to press. Otherwise, it is just a gross oversite by Anandtech not to include Mushkin. Whatever the case, Mushkin is a big name company with many supporters who will vouch for their quality. I am going to upgrade my memory shortly to these exact DIMMs so I feel comfortable suggesting them. 2-2-2 latency just sounds too good to pass up. How similiar does the RAM have to be? I bought a Dell with 2x128 meg ram and want to up it to 512 megs. Do I need the exact same Brand? Just the same sizes? (ie. 2 more 128 meg sticks) Is there something I should look for especially? Regarding "Mixed Memory" configurations, the Best Memory Timings are the fastest timings THAT PARTICULAR COMBINATION WOULD RUN. So they are the best timings for that mix of Dimms. Mixed pairs - particularly widely different memory pairs - can take a very large performance hit in 865/875 boards. The reduction in performance is MUCH greater than we would expect. As was also stated, we have seen cases of 2 pairs of dimms from different manufacturers that match closely on capacity and timings that perform just as well as 2 matched pairs. SPD timings of the mixed DIMMs." column should be labelled "worst memory timing"? slower timing, 2-7-3-3, instead of 2-5-2-2. How does that result in a 25% performance loss? I'll certainly run a few benches myself. It is really interesting that those guys who should know, that is memory and chipset manufacturers are lagging so far behind the "fanboy" community in terms of understanding how things actually work and what factors are really important.